Distracted driving is one of the most significant dangers that drivers face on the road today. Cell phone use, text messaging, and other actions can divert your attention away from the wheel and increase your likelihood of experiencing a collision. By eliminating the habits associated with distracted driving, you can help to keep yourself and others safe on the road. 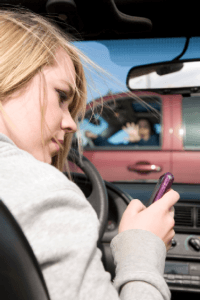 Let’s review some important facts about distracted driving. Text messaging is one of the common activities associated with distracted driving. When you send a text message, your attention will be away from the road for approximately five seconds. If you are travelling at highway speeds, five seconds is the time it will take you to drive the distance of a football field. To eliminate the dangers of texting and driving, it is important to put your cell phone away when you are behind the wheel. Despite the dangers of using a smartphone or cell phone while driving, cell phone use while driving has increased or remained constant among drivers in the past several years. According to recent studies, more than six hundred thousand drivers are using their cell phones while driving at any given moment. Young drivers are one of the groups that is most affected by the dangers of distracted driving. In fact, it is estimated that drivers in their twenties make up nearly a third of the distracted drivers who are involved in fatal car accidents. To help you keep your son or daughter safe behind the wheel, you may want to consider enrolling in a driver training course at Top Driver. Our highly knowledgeable instructors will provide your teen with the knowledge and training needed to become a safe and responsible driver. For more information about the driver test training that we offer to the Highland Park area, call us at (888) 471-5418.